Community councillors Bill Harvey, Allan Strang and Sean MacIntyre examine the surface. Work on a road which is to serve 600 new houses being built at near Oban has been condemned. And the timing couldn’t be worse as Housing Minister Kevin Stewart is due to cut the first sod on the building project at Dunbeg on Monday. 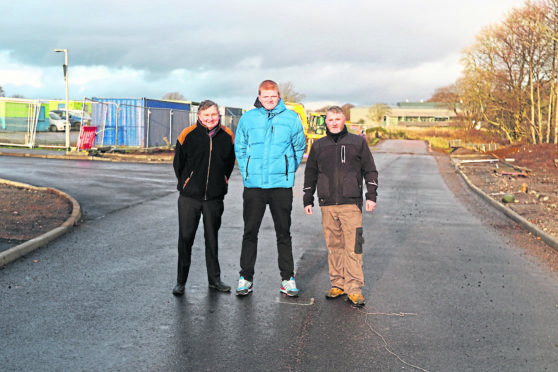 The £1.2million job to improve Kirk Road got underway a year ago as Argyll and Bute Council hailed the “exciting first phase of the Dunbeg masterplan”. The single track road has been widened and a pavement added to cope with the new development. But yesterday the authority confirmed the work has not been completed to an acceptable standard by the contractor. The main contractor for the work was NRS Group with Breedons being the sub contractor. Neither responded to requests for comment yesterday. Initial works took place in January last year with a few breaks in between. The job was due to be complete in December.